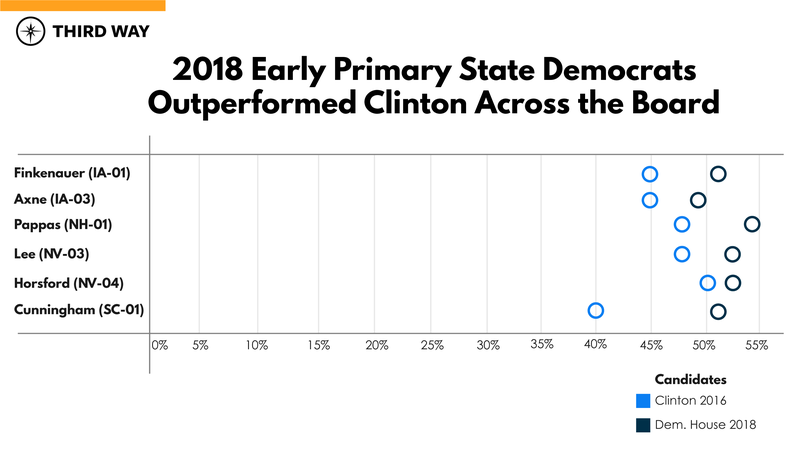 What Kind of Democrats Won in the Early Primary States? How Did These Pragmatic Progressives Perform? What Did They Run On? The 2020 Iowa Caucus will take place in 368 days. New Hampshire will quickly follow, then voters in Nevada and South Carolina will get their chance to weigh in on who should go up against Donald Trump in the biggest election of our lifetimes. The Democratic political world is already shifting its focus to what is to come in these early primary states. But what just happened in these places in 2018? And what lessons should the bevy of potential 2020 Democratic presidential candidates take from those midterm results about both the path to the nomination and how to beat Trump? There were six top U.S. House races across Iowa, Nevada, New Hampshire, and South Carolina in 2018. Democrats won all six. We dug into each of these races to see how Democrats ran and won both in the primary and the general. What united this diverse group of Democrats—gay and straight, black and white, three men and three women—was a thoughtful brand of pragmatism and a focus on healthcare and expanding economic opportunity for the people of their district. In 2018, Democrats won all six competitive House races in the four early primary states. Three of these wins were Democratic pickups: Abby Finkenauer in Iowa’s First Congressional District (IA-01), Cindy Axne in Iowa’s Third Congressional District (IA-03), and Joe Cunningham in South Carolina’s First Congressional District (SC-01). The other three were Democratic holds: Susie Lee in Nevada’s Third Congressional District (NV-03), Steven Horsford in Nevada’s Fourth Congressional District (NV-04), and Chris Pappas in New Hampshire’s First Congressional District (NH-01). Not a single one of these winning candidates was a far-left populist. Five of six affiliated with the moderate New Democrat Coalition in their campaigns, and the sixth, Abby Finkenauer, shared similar positions on critical issues like healthcare and the economy.1 They ran not on a Democratic Socialist agenda but on mainstream and moderate solutions to the problems that most vex their constituents: healthcare affordability and access, expanding economic opportunity, and fixing our political process to better represent the people. True to her district, Finkenauer centered her candidacy on the unifying values of hard work and opportunity, labeling herself as a “staunch defender” of working families.3 She introduced herself to voters with a TV ad that proclaimed, “Iowans don’t want handouts – heck I’m still paying off student loans – they just want a chance to live good lives.”4 And instead of framing herself as reflexively against the other party, Finkenauer led with a message that she was for Iowa families. When it came to one of Republicans’ top attacks against Finkenauer—immigration—she emphasized a bipartisan approach that was consistent with American values over more polarizing options. A stunning 46% of all ads Republicans ran in this race were attacks on Finkenauer on immigration.5 In response, she criticized both parties for playing politics on the issue and called for comprehensive immigration reform that included protecting Dreamers. She explicitly rejected abolishing ICE.6 This approach allowed Finkenauer to overcome Republicans’ divisive and sometimes even racist attacks. Meanwhile, in another part of the crucial primary state of Iowa, Cindy Axne, a first-time candidate and fifth-generation Iowan, challenged and defeated David Young in IA-03. Axne prevailed in the state’s most contested Democratic congressional primary, then again in the general election, by keeping a laser focus on the core issues that voters care about and advocating for modern and pragmatic solutions to address them. The district, which includes Iowa’s largest city (Des Moines), is the state’s most urban and economically dynamic place. Thirty-two percent of adults have a college degree, and it has the highest broadband access and housing occupancy rate in the state.9 Although it differs in those ways from Finkenauer’s district, these Iowa primary and general election voters picked a strikingly similar person to represent them—a mainstream Democrat over both a far-left and a Republican candidate. Axne framed her politics through the lens of equity and getting things done. She relayed how she became active in politics after learning that not all children in West Des Moines public schools could attend full-day kindergarten. After encountering this inequity, Axne spent a year advocating for full-day kindergarten for all before school officials relented. And she did the same on the most salient issues of the 2018 election by calling for “leveling the playing field” through good-paying jobs and pushing for credible solutions to improve our healthcare system. On healthcare, Axne didn’t settle for the status quo or try to sell voters on a single-payer system. Instead, she called for actionable steps that Congress could actually achieve, such as improving the Affordable Care Act, and creating a public option where people younger than 65 would have access to buy into Medicare.10 And she communicated her positions by sharing personal experiences; specifically, relaying how her family had been dropped by their healthcare provider three times in four years. Lee championed a unifying message on the campaign trail and used it to draw a contrast with the “dysfunction and gridlock” in Washington.17 This narrative was on display in one of Lee’s major ads, with the narrator proclaiming “For a fresh start Susie Lee . . . she shakes things up, works with anyone, gets the job done. Susie Lee, what Washington needs.” Rather than focus on maligning her opponents, Lee took aim at Washington’s failure to get results and made a persuasive pitch about how she could help get things done for her constituents. @SusieLeeNV focused her economic message on creating opportunity and standing up for the bargain we’ve made with seniors. And true to his pledge to focus on solving local problems, Cunningham made the issue of offshore drilling the primary issue in his campaign. Specifically, he promised to fight Trump’s plan to initiate offshore drilling off South Carolina’s coast. In one memorable ad, Cunningham swam in the ocean to highlight his opponent’s support for offshore drilling and the adverse effects on the district’s climate and economy. Cunningham elevated an issue that resonated deeply across the community, rather than one that was important to just one slice of the electorate. Cunningham easily won the Democratic primary with 72% of the vote.33 In the general election, he faced off against Arrington, a Trump-style Republican who had defeated incumbent Mark Sanford in the primary. On election night, Cunningham defeated Arrington by a narrow two-point margin.34 Republicans helped put this district in play by nominating a Trump-style candidate on the partisan extreme, while Cunningham used a pragmatic message and focus on core issues to win over a broad coalition of voters. True to his pledge to focus on solving local problems, Cunningham made the issue of offshore drilling the primary issue in his campaign. 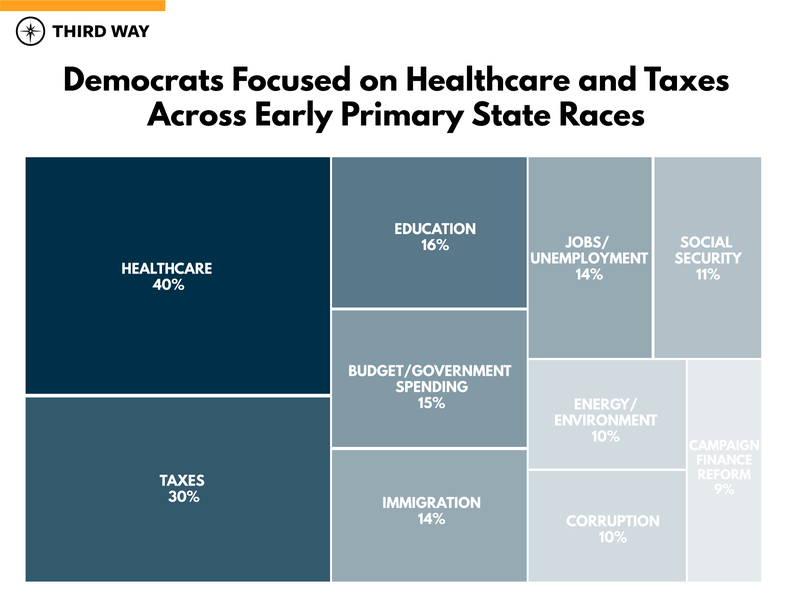 These Democrats illustrated that if you run as a pragmatic progressive with an agenda deeply rooted in voters’ core interests, you can both defeat far-left candidates in a primary and forge a broad coalition of support that can win in purple and red places in a general election. These six Democrats campaigned on the core issues that voters care about most, as well as some that uniquely impacted their communities. One of the best ways to evaluate the issue priorities of campaigns is to analyze what they highlighted in campaign ads. The graphic below, which features Kantar Media political ad data, illustrates the share of ads that mentioned key issues across the six races. Note that the total adds up to more than 100% because some ads highlight multiple issue areas. Healthcare dominated, and every single one of these successful Democrats focused on voters’ core interests like access and reducing cost, as well as preserving seniors’ earned benefits of Social Security and Medicare. None of the six supported single-payer healthcare. Their economic messages focused not on Democratic socialism but on expanding opportunity through good-paying jobs and investments in local communities. In the same way, Susie Lee and Steven Horsford elevated secondary education and skills training, Chris Pappas addressed the opioid crisis, and Abby Finkenauer and Cindy Axne highlighted workers’ rights in a state that has been ravaged by far-right statewide governance, as well as early childhood education. The six winning Democratic House candidates featured here illuminate a path forward for presidential hopefuls who hope to woo the same voters in early primary states. Five of the six formally allied with the moderate New Democrats in their campaigns, and they all positioned themselves as the mainstream choice in their races—and five of the six defeated far-left alternatives in their primaries. All six victors elevated issues that matter to voters in their daily lives—such as healthcare and the economy—and also honed in on a few local matters that have an outsized impact in specific communities. And not a single one advanced a far-left agenda. Instead, they all took mainstream positions like bolstering Obamacare over embracing proposals like single-payer healthcare. The lesson for 2020 presidential aspirants is clear: there’s a broad coalition out there waiting to be engaged, and Democratic voters in the states that will be influential in the primary process want a candidate who will bring the country together around a mainstream agenda and advocate on behalf of their core economic interests. Six amazing Democratic candidates have already led the way—let’s hope the 2020 field follows in their footsteps. 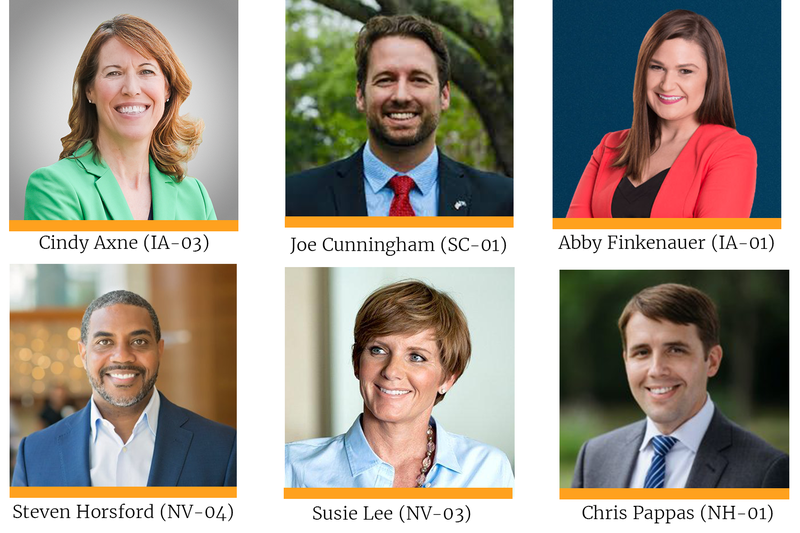 NewDemPAC, “Endorsed Candidates,” Accessed December 5, 2018. Available at: http://www.newdempac.com; See also, Abby Finkenauer for Congress, “Fighting for access to quality and affordable healthcare,” Accessed December 5, 2018. Available at: https://www.abbyfinkenauer.com/issues/fighting-for-access-to-quality-and-affordable-healthcare/. U.S. Census Bureau, “American Fact Finder,” Accessed December 5, 2018. Available at: https://factfinder.census.gov/faces/nav/jsf/pages/index.xhtml. Abby Finkenauer for Congress, “Meet Abby Finkenauer,” Accessed December 4, 2018. Available at: https://www.abbyfinkenauer.com/about/. Ad data: Copyright 2018 by KANTAR MEDIA INTELLIGENCE. All Rights Reserved. Abby Finkenauer for Congress, “Bipartisan Immigration Reform,” Accessed December 4, 2018. Available at: https://www.abbyfinkenauer.com/issues/bipartisan-immigration-reform/. Iowa Secretary of State, “Election Results & Statistics,” Accessed December 4, 2018. Available at: https://sos.iowa.gov/elections/results/#17. See also, Bleeding Heartland, “IA-01: Democrat Courtney Rowe may challenge Rod Blum,” January 28, 2017. Available at: https://www.bleedingheartland.com/2017/01/28/ia-01-democrat-courtney-rowe-may-challenge-rod-blum/. POLITICO, “Iowa Election Results 2018,” Accessed December 4, 2018. Available at: https://www.politico.com/election-results/2018/iowa/. Cindy Axne for Congress, “Issues,” Accessed December 5, 2018. Available at: https://cindyaxneforcongress.com/issues/. Pete for Iowa, “Endorsed By,” Accessed December 5, 2018. Available at: http://peteforiowa.com/. See also, Josh Voorhees, “After the Bernie Buzz,” Slate, May 31, 2018, Accessed December 5, 2018. Available at: https://slate.com/news-and-politics/2018/05/bernie-endorsed-pete-dalessandro-limps-to-the-finish-in-iowas-3rd-district.html. Iowa Secretary of State, “2018 Election Results,” Accessed December 5, 2018. Available at: https://sos.iowa.gov/elections/results/#17. See also, POLITICO, “Iowa Election Results 2018,” Accessed December 4, 2018. Available at: https://www.politico.com/election-results/2018/iowa/. Chris Pappas for Congress, “About Chris,” Accessed December 5, 2018. Available at: https://www.chrispappas.org/about-chris/. New Hampshire Secretary of State, “2018 Primary Election Results - September 11, 2018,” Accessed December 5, 2018. Available at: http://sos.nh.gov/Elections/Election_Information/2018_Election/2018_Primary_Election_Results_-_September_11,_2018.aspx. See also, POLITICO, “New Hampshire Election Results,” Accessed December 5, 2018. Available at: https://www.politico.com/election-results/2018/new-hampshire/. Susie Lee for Congress, “Susie's Story,” Accessed December 9, 2018. Available at: https://susieleeforcongress.com/susies-story. Susie Lee for Congress, “Economic Opportunity,” Accessed December 9, 2018. Available at: https://susieleeforcongress.com/economic-opportunity. Nevada Secretary of State, “Election Night Results 2018,” Accessed December 9, 2018. Available at: https://www.nvsos.gov/silverstate2018pri/USCongress/. Weiss for Nevada, “Issues and Platform,” Accessed December 9, 2018. Available at: https://www.weissfornevada.com/issues-and-platform. See also, Eric Stoltz for Nevada’s 3rd District, “In 2016,” Accessed December 9, 2018. Available at: https://stoltz1420.com/#/. See also, Susie Lee for Congress, “Values,” Accessed December 9, 2018. Available at: https://susieleeforcongress.com/values. POLITICO, “Nevada Election Results,” Accessed December 17, 2018. Available at: https://www.politico.com/election-results/2018/nevada/. Facebook, “Steven Horsford: Fighting For All Of Us,” Accessed December 10, 2018. Available at: https://www.facebook.com/stevenhorsford/. U.S. Census Bureau, “American Fact Finder,” Accessed December 10, 2018. Available at: https://factfinder.census.gov/faces/nav/jsf/pages/index.xhtml. Ad data: Copyright 2018 by KANTAR MEDIA INTELLIGENCE. All Rights Reserved; See also, Office of the U.S. House Historian, “Horsford, Steven,” Accessed December 17, 2018. Available at: https://history.house.gov/People/Detail/15032387263. Pat Spearman for Congress, “Endorsements,” Accessed December 11, 2018. Available at: https://spearman4nevada.com/. See also, Justice Democrats, “2018-Slate for Justice,” Accessed December 11, 2018. Available at: https://www.justicedemocrats.com/candidates/. See also, Our Revolution, “2018 Election Results,” Accessed December 11, 2018. Available at: https://ourrevolution.com/results/. Nevada Secretary of State, “Election Night Results 2018,” Accessed December 11, 2018. Available at: http://www.silverstateelection.com/. See also, Nevada Secretary of State, “Election Night Results 2014,” Accessed December 11, 2018. Available at: https://www.nvsos.gov/silverstate2014gen/USCongress/. Daily Kos, “Daily Kos Elections' presidential results by congressional district for 2016, 2012, and 2008,” Accessed December 11, 2018. Available at: https://www.dailykos.com/stories/2012/11/19/1163009/-Daily-Kos-Elections-presidential-results-by-congressional-district-for-the-2012-2008-elections. Joe Cunningham for Congress, “Get to know Joe,” Accessed December 11, 2018. Available at: https://www.joecunninghamforcongress.com/. See also, Joe Cunningham for Congress, “Meet Joe,” Accessed December 11, 2018. Available at: https://www.joecunninghamforcongress.com/meet-joe. Joe Cunningham for Congress, “Issues,” Accessed December 11, 2018. Available at: https://www.joecunninghamforcongress.com/myvalues. South Carolina Election Commission, “2018 Statewide Primaries,” Accessed December 12, 2018. Available at: http://www.enr-scvotes.org/SC/75708/Web02-state.203322/#/. POLITICO, “South Carolina Election Results 2018,” Accessed December 12, 2018. Available at: https://www.politico.com/election-results/2018/south-carolina/.